Praised for his "superstar qualities" [Le Libre], David Fung has performed with the major orchestras of the United States, Europe, Asia, and Australia, and has appeared at the world's foremost festivals and concert venues with repertoire spanning from Mozart to Tan Dun. 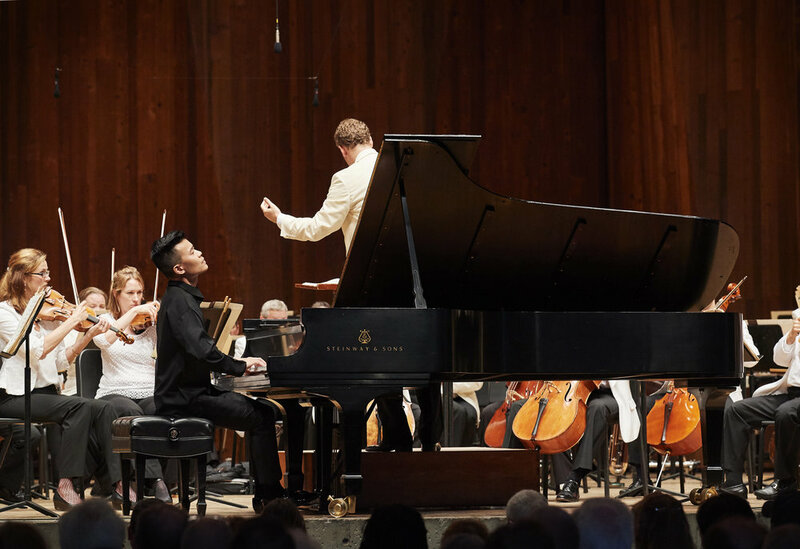 In July 2016, Mr. Fung’s highly acclaimed debut with the Cleveland Orchestra at the Blossom Music Festival was “everything you could wish for” (Cleveland Classical), and he was further praised as an “agile and alert interpreter of Mozart’s crystalline note-spinning” (The Plain Dealer). In the following week, he performed Rachmaninov’s Rhapsody on a Theme of Paganini at the Beijing National Stadium for their Olympic Summer Festival. This season, he has solo recital debuts at the Brussels Piano Festival and the Kennedy Center, presented by Washington Performing Arts, and performances with Orpheus, the Albany Symphony, the Arkansas Symphony, the Israel Chamber Orchestra, the Melbourne Chamber Orchestra, the Nordwestdeutsche Philharmonie, the Marin Symphony, the Sun Valley Summer Symphony, and the Vallejo Symphony. He performs for the first time at the Bridgehampton Chamber Music Festival and the Yeosu International Music Festival in Korea, and he returns to Ravinia Festival and Lincoln Center’s Great Performers this season. Mr. Fung garnered international attention as a winner in two of the "top five" international piano competitions (the Queen Elisabeth International Music Competition in Brussels and the Arthur Rubinstein Piano International Masters Competition in Tel Aviv). In Tel Aviv, he was further distinguished by the Chamber Music and Mozart Prizes, awarded in areas in which Mr. Fung has a particularly passionate interest. The first piano graduate of the prestigious Colburn Conservatory in Los Angeles, Mr. Fung holds degrees from the Hannover Hochschule für Musik and the Yale School of Music. His teachers include Claude Frank, Peter Frankl, John Perry, and Arie Vardi. Mr. Fung is on faculty at the University of Georgia and is a Steinway Artist.